I walked into my office and saw Hassan . I looked dazzed for some minutes, did Hassan just call me by my name.
" Don't worry I will be fine" I said as I dashed off to the dpo's office. I saw the DPI on his seat receiving a phone call.He motioned me to come close and seat down.
" 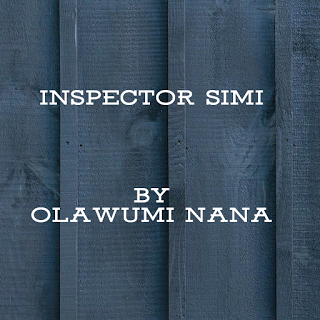 So,Inspector Simi,have you started" he asked.
" yes! I have started,but I haven't found much" I said confidently.
" OK,good luck,you may go"
" Thank you sir".I said and left the office. I went straight to the car park.I entered my car and drove off to No 24,Alagbade,Oke -ijebu,Akure. That was Mr Ibukun's address. "Who is knocking at the door?" a voice answered from behind the door. I remained silent,as I heard the door cracked open.
" yes!who are you".a middle aged -mab demanded with anger flushing in his eyes. "I am Inspector Simi from NPF A division..I said showing him my ID card. I'm looking for Mr ibukun Ade"
"Ade no longer lives here"
"So where does he lives?" " He didn't say,he just came and packed out his things one day.he didn't tell anyone one where he was moving too,but you can check his mother's house. " " The woman lives at Iju. Her house is just besides the Oja-ale market. She is popularly known as Iya Eleja"